'We must destroy life on earth completely. Every living being.' Arriving on Earth in 1975, the Doctor, Jamie and Zoe discover that the component manufacturers International Electromatics has a vice-like grip on the world's technology. When he encounters the firm's company director, the Doctor realises there is something very odd about Tobias Vaughn... Brigadier Lethbridge-Stewart is also aware of unusual activity within International Electromatics, and before long UNIT has the help of the Doctor in its investigations. Vaughn is in fact in alliance with the Cybermen, and together they are masterminding an aggressive invasion of Earth. The ubiquitous IE technology is set to paralyse the planet's population, whilst the sewers of London are being used as a refuge in which the Cyber forces are massing, ready to burst out upon an unsuspecting world. 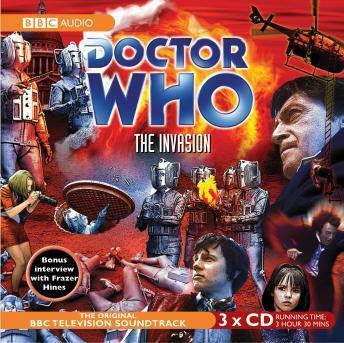 If the Doctor and his friends are to defeat both Vaughn and the invasion, they must risk life and limb in an adventure of epic proportions. In an exclusive bonus interview, Frazer Hines - who also narrates the story's soundtrack - recalls his experience of playing Jamie in Doctor Who.